Marquette won convincingly Saturday, but the Golden Eagles went 1-5 against their six nonconference opponents ranked in the top 100 of the RPI this season. MILWAUKEE — With yet another rout of an inferior opponent, Marquette proved yet again that it can take care of business against teams it is supposed to beat. Marquette’s 71-48 victory over Samford in its nonconference finale Saturday afternoon at the BMO Harris Bradley Center left the Golden Eagles at 8-5 heading into Big East play. Seven of the Golden Eagles’ eight wins have come over teams with an RPI over 215, adding Samford, at 324, to that list Saturday. The Golden Eagles went 1-5 against their six nonconference opponents ranked in the top 100 of the RPI, leaving them with two distinct portions of the schedule early on. 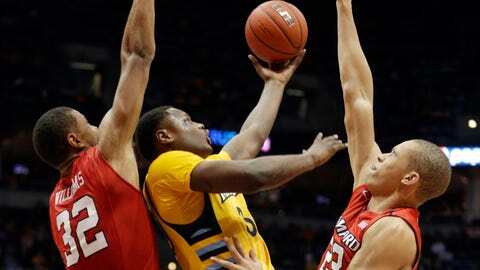 What has held Marquette back against the better teams on its schedule? Buzz Williams feels it has been a lack of consistency from top to bottom, getting one thing out of a player one day and something entirely different the next. "At some point, if we’re going to be better, we’re going to have to find some sort of consistency," Williams said. "I don’t mean consistency in numbers. You only find consistency in numbers when you have consistency in effort. You can’t have consistency in effort unless you do it every day. If you do it every day, you will eventually figure out where your watermark is. "You can’t be consistent unless you work every day. Once you start doing those kind of things, then you can start figuring it out." Williams said Marquette has wasted too many possessions trying to figure out which players were going to be consistent on that day. It has cost the Golden Eagles against the better teams they’ve played but it’s something that can be made up for in games against inferior opponents. The Golden Eagles have found success in the past by becoming a consistent unit. Sure, Marquette has had some talented players come through its program, but those players bought into the bigger plan and became better because of it. This year’s group has yet to find that. To Williams, part of that is buying in to a team concept. Williams said experienced players need to set an example, young players need to follow and those in the middle need to pull in the right direction rather than the other way. "It’s not consistency in the individuals," Williams said. "Actually I think all of them individually are getting better. But in order to have success in Big East play, we have to collectively improve. The only way we can collectively improve is if we individually improve. The only way we can individually improve is if there is consistency in our work." Williams raised the question asking who has been Marquette’s most consistent player this season. Someone answered Davante Gardner, which he didn’t disagree with but raised an interesting point. "If he’s our most consistent guy and if you study his numbers, they are the worst they have been per minute in his career," Williams said. "That’s not a good sign." While not trying to justify his team’s five losses, Williams feels a bit more consistency could have completely changed the tone of Marquette’s season at this point. "Why are we 8-5?" Williams pondered. "We’re 8-5 because there’s no consistency within what we are doing. Should we be 8-5? I don’t know. We’ve played more top 50 games than anybody in the country other than Kansas. Nobody is going to write that, though. What they are going to write is of the games we have played, we’re 1-4. "It’s important to learn from losing otherwise how can you figure out any consistency to winning? You can’t." The Golden Eagles are going to need to finish near the top of the Big East in order to extend the school’s NCAA tournament streak. In order to get on a roll in league play, Marquette must figure out what’s caused the lack of consistency. "I’m not mad, I’m not throwing our guys under the bus," Williams said. "At the end of the day they are going to say I can’t coach, I got that. That’s the shoes that I walk in. I’m not being sarcastic at all about that. "They are all great kids and I do believe in them. Maybe I function better when people think we’re no good. I don’t know if we’re any good. "We have to figure out how we can have some consistency. If we don’t, then we are going to be 8-5ish." Wilson hurt: Marquette senior forward Jamil Wilson played just five minutes Saturday after suffering a left knee injury while being fouled on a dunk with 15:09 left in the first half. Williams said Wilson was set to undergo an MRI later Saturday night, but is hopeful he’ll be able to play Tuesday night in the Big East opener at Creighton. "I would say he’s fine," Williams said. "I would say he probably tweaked something. I think he could have played, he wanted to play. Not because of Samford, I think regardless of who our opponent was in the last non-conference game I don’t think I would have played him. It was the conservative approach to make sure nothing structurally is wrong." 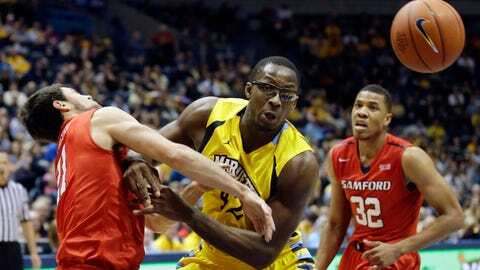 To say Marquette needs Wilson would be an understatement. He entered Saturday as the team’s second-leading scorer at 12.5 points per game and will likely be the guy matched up the most with Creighton star Doug McDermott on Tuesday. The masked man: Todd Mayo doesn’t necessarily like wearing a mask to protect his broken nose, but he understands why he has to. Mayo wore the mask for a second straight game Saturday, scoring 13 points in 25 minutes off the bench. He revealed he actually suffered the broken nose in Marquette’s tournament in Fullerton but didn’t realize it was broken until he got hit on the face against Ball State on Dec. 17. "It’s a little bit irritating, but I have to protect my nose," Mayo said. "I tried to get it fixed the day I went to the doctor but it was a late break so they couldn’t really do anything." Mayo was told he’ll have to wear the mask for three weeks but said he’s hoping to shed it after a week and a half.